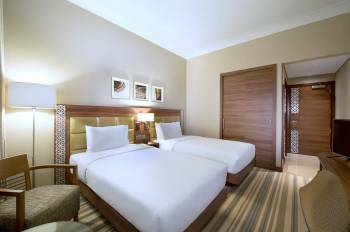 You’ll be in the Port Rashid district of Dubai when you stay at Hilton Garden Inn Dubai Al Mina. Our Dubai hotel has easy access to attractions and the Jebel Ali Free Zone, and is 10 minutes from major business hubs. Find any item you need at The Dubai Mall, the largest mall in the world, also just 10 minutes away. Unwind on Jumeirah beaches, and learn more about the history and culture of the area at Heritage Village, Global Village and Dubai Museum.The spacious rooms at our Dubai hotel offer comfortable beds, HDTVs, complimentary WiFi and ergonomic work spaces and chairs. You’ll have a safe, coffee/tea maker and mini-fridge in your room to help you feel at home. Most rooms have views of the port or city.Our on-site Garden Grille & Bar serves delicious international and local dishes, including a children’s menu. Relax with a cocktail at the bar, or enjoy 24-hour room service if you prefer to eat in. Hold a small get-together or large social event in our meeting space, which is flexible enough for large or small functions. Work out in the fitness center or refresh in the temperature-controlled rooftop pool.